It's the thought that counts when giving presents - or is it? Discount retailer Poundland has caused controversy with its latest Valentine's Day gift, a heart-shaped package with nothing in it. 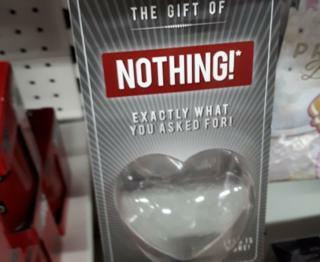 The Gift of Nothing, naturally priced at £1, is intended as "a bit of fun", says the retailer. But Friends of the Earth and other campaign groups have complained that whatever Poundland was thinking about, it certainly wasn't the environment. Julian Kirby, Friends of the Earth's lead campaigner on plastics, criticised its use of "wasteful plastics", adding: "Let's hope folly like this goes unloved and doesn't reappear." Another campaigner, Sian Sutherland of A Plastic Planet, said: "This product is designed to go straight into the bin, but will last for 500 years. "It is a symbol of everything that is wrong with our view of the world." Reaction on social media has varied, with some users amused and others outraged by Poundland's stunt. One user, Kim Patterson, tweeted: "To all the ladies out there please don't tell your other halfs you want nothing for Valentine's Day cos courtesy of Poundland this might just be what you get." Another, blogger Stephen Milton, tweeted: "Nothing fun about this gross use of unnecessary plastic packaging... massive PR FAIL."